The debate over restitution of treasures from antiquity is only rarely troubled by facts, but recently some have emerged to embarrass the Greek government, and spark a response. Tourists and travel companies have been complaining that too many ancient sites, including Delphi, where the famed oracle sat upon Mount Parnassus, or Delos, the island where Apollo had his mythical home (pictured), are poorly maintained or too often closed to the public. 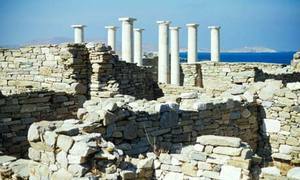 Until complaints changed the policy this month, Delphi was only open until 1 pm; the museum of Delos was closed until last week for lack of staff, according to this account in the Guardian newspaper. "The situation at museums and sites around the country is bad," the culture minister, Michalis Liapis, conceded in parliament last week. "It has to be corrected." The government has quickly voted funds for extra staff for museums and sites that have been otherwise closed. But this is an ongoing problem in all the countries that have been clamoring for the return of their treasures from Western museums like the Metropolitan, the Getty, the Louvre, the British Museum. The problem is one of hypocrisy. Countries like Greece cannot justifiably demand the return of objects taken in recent decades by looters, or a century ago by imperial-minded "collectors," if they cannot adequately care for the objects and sites they already have. But reality is a harsh taskmaster. Caring for antiquities costs money. The answer lies not in pointing fingers, as is suggested by the article in the Guardian. The answer - the only possible answer - lies in recognition that the responsibility for preservation lies with us all. That concern, the concern over preservation, must take precedence over the issue of possession.